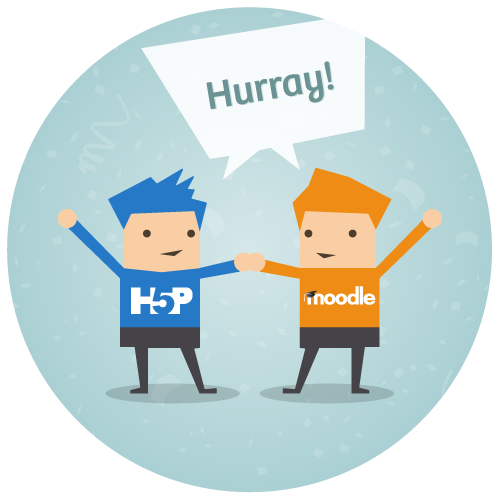 We’re excited to announce that the H5P plugin for Moodle is finally ready. Moodle users may now install H5P, and be able to create great interactive content directly from Moodle. Similarly, H5P users may install H5P, and use all its features in the world’s most popular open source Learning Management System. We look forward to seeing what the two open source communities may achieve in the future. H5P beta for Moodle has been available for the community and used on over 100 installs for about three weeks now. Not a single bug has been reported. We’re now sending the code to Moodle.org, and consider it a Release Candidate. It has gone through all our standard regression testing routines, as well as considerable use in the community, and some Moodle consultants have been using it in production since May without any issues. H5P for Moodle was created in cooperation between Mediamaisteri and Joubel, with funding from Mediamaisteri. Joubel has also received funding to put some extra pieces in place from a community member in the US, and will be releasing a new version soon with APIs for changing styling, and other advanced features already available for WordPress and Drupal. Last, but not least: Moodle will be kept up to date with all upcoming H5P releases. "H5P for #Moodle is finally ready! Learn how to integrate the powerful authoring tool in Moodle https://h5p.org/blog/h5p-for-moodle-is-ready"
What moodle version(s) are supported? I tried it on 2.6.11 and it seemed to do fine. I haven't done much as yet but am excited about the possibilities of a more interactive site. We've tested with 2.7 - 3.1. Very exciting, I've been using H5P since the begining of the year and have created two whole courses using it in Wordpress. I'll be transferring these straight into Moodle and plan to use H5P for nearly all of my future course developements. A big thank you and well done! What do you think you would prefer? Hopefully, we can get some extra time on our hands soon and make these improvements. Also, I believe some people have requested an easier way to clone content as well. I'm not sure but it feels a bit like the content should be cloned if it's used multiple places, as it's a one to one relationship between the activity and grades. I.e. if the same content is used in two lessons I guess you don't want the same grade for both. I agree - it would be useful for H5P content to have a clone button (as an entirely unique resource) to leverage off the settings and design of a previously developed resource. Great, thank you! Your input will be taken into account when planning the next release. Hi icc, I recently posted to this thread and in my previous post above I assumed that it would be possible to embed a Moodle H5P resource into a page resource. We have installed the plugin on our test server and it doesn't seem to be the case. Currently, the only way I can do this is by running a wordpress site with H5P and embedding the resource that way into Moodle - of course the result does not get populated in the gradebook. I am trying to understand the issues... is the problem the following: If you create an H5P resource in Course A and then you embed it in Course B, the result of the activity is sent to Course A? Then there are issues around enrolment etc and messing up the gradebook of Course A. What if there was a course ID verification that only let the user embed the resource within the course? There's been big interest in H5P at our university and our designers and developers were very much looking forward to the potential of using H5P as a way of improving the user experience, interactivity and the design of Moodle courses and this can only be done if it can be embedded on pages and courses (or by using the shortcode option that is being explored). This can be done in several ways, what you suggest is an embed if I got it right. Embedding has the problem that there only is one instance of the content, thus it will keep its original connections to a course, its users and their grades. One way to solve this would be to create the H5Ps as a decoupled resource which is not connected to any course, then allow inserting the resources as standalone instances into courses. However this would require a system for keeping track of all H5P resources and inserting them in courses, I'm not sure if this would be possible in Moodle. Now I would like to make the case that cloning content is a good alternative, apart from taking up additional disk space. Cloning or exporting content is one of the big advantages of H5P, you can download content from any page and upload it to your course, likewise you can download content that you just created for a course, and upload it to a new course. This should give you all the features of course, user and grades integration, without too much of an productivity penalty. Is this an alternative approach you could make use of ? Icc is on vacation at the moment, I believe he will be back in two weeks time. embed the resource in a more user-friendly position in the course i.e. the course introduction or a page resource. The resource only exists once from a user point of view and from a db point of view - it is still the single resource. Therefore, the embedded H5P resource maintains it's connections with the course, users and grades - it is just in a different place. It seems that the issue arises when users want to embed the resource perhaps in another course or an external webpage. In which class the connections to the course would be severed. The problem with Moodle is that it is badly designed for usability/interactivity (or at least very dated) and we thought H5P could have been a way of improving the user experience but it cannot be done without the option of embedding. If you wanted to make the H5P activities available for other sites I can think of two or three options - building on the method you already use (as many of us do with moodle). Create a New course and make it publicly available (i.e. allow guest access). Create your H5P's here and hide them. Change the guest role to allow access to hidden resources for that course. Then you should be able to embed them for on other sites. Do the same as above, but create your H5P activities on the 'Front Page'. Other than that, you could install wordpress on a sub-folder on your domain and add the H5P plugin. You can download your activities from moodle and upload to Wordpress, so you don't have to create any new content - providing a publicly accessible area for H5P's. Personally I embed H5P activities from wordpress at present, but I'm looking to migrate these to Moodle. Any improvement to insert H5P activities would be welcome. Although Using a 'filter' is probably a good solution - similar to the wordpress insert short-code function allowing H5P activities anywhere. Another solution mentioned was giving capability to the wysiwyg editor to insert H5P activities, which would be an awesome approach. Thank you for the clarification Sarah, those are some excellent examples. I would love to see them supported as well. Do you know of any examples of Moodle plugins that allow you to embed a Moodle activity within other content, such as the course introduction or a page resource ? Currently, I am using wordpress to host the resources and embedding them in moodle. It is working fantastically except for the interactive video iframe does not work in Moodle on an iPhone 6! it works everywhere else so well. The course presentation works in iPhone 6. Thanks for the link. That is really great news about iOS 10. The issue, however, is that the interactive video does not appear properly when embedded in Moodle and other sites (it's just a black bar) when viewing on iPhone. It is the newer version of the interactive video which is causing problems. I've still got some interactive video assets in the deprecated version and it works fine embedded on iPhone (Moodle and other sites) however the new version of the interactive video just appears as a black bar. This includes interactive video embedded from the H5P site as well. We are adding several new features for Interactive Video in the upcoming release. We will do some testing of your scenario before it is released. I too feel there should be some form of moodle 'filter' (aka shortcode) that will allow to insertion of H5P activities, so they can appear anywhere. Currently I use the Lesson module of moodle and embed H5P activities using the iFrame code (from wordpress). I also do this within moodle 'Labels' which can appear anywhere on the course page. I have use 1 course section per H5P, I add a label with the iFrame code to embed H5P presentations, so they appear directly on the course sections. This makes for fairly smooth navigation between H5P presentation (users just have to come out of full screen mode at the end of the H5P. For this I set 1 section to be displayed at a time within the course config. It would definitely be a BIG advantage to have filters (shortcodes) that allow H5Ps to be inserted/embedded anywhere and would make things much easier. I would however agree that when embedding content in this way, it would be again advantageous to copy the activity, so it can be individually graded - I believe tracking how well a student performs is paramount when it comes to online learning. A workaround for embedding activities created in Moodle is to move them to a hidden course section, then change user permissions to access/view H5P activities, but not for hidden sections. This has it's own set of issues, but is something I have done for a myriad of different reasons for other activities in the past. H5P flow control - Within the lesson module there is something called 'flow control' which allows the editor to choose an activity to link to at the end of a lesson. I have hacked up the lesson module and 'borrowed' certain code and hacked in my own, to add this functionality to all activity types. This allows me to easily create links between moodle activities, so when they are complete (or have reach to end of them) a button button appears to either return to the course page or 'Continue to next activity ##activity name##'. This provides great flexibility and really really helps navigation from a student point of view. Students don't get lost, don't have to click an unnecessary amount of buttons and everyone is generally happier because of the ease of use. This has always been a problem with Moodle - that is there is no smooth navigation between learning activities (or very limited at least). It would be fantastic to have improved navigation capability for H5P activities, so they can be easily connected/linked together - I can stop using the 'flow control' method I hacked in and rely on built in functionality. Thaks alot for your insight into this. Easy flow control between activities makes a lot of sense. Hi stopbit, it sounds like you have gone to a lot effort to build a navigable user experience. There is an interesting conditional feature in moodle that allows you to restrict access to an activity/resource until the user has somehow completed the previous however I don't think it quite achieves the same smooth experience you describe. I also use the 'conditional feature' within moodle in conjunction with the navigation improvements. This prevents students from progressing until certain requirements are met, i.e. grades achieved in previous modules etc. before access is permitted to an activity. There is also a completion setting too. I improved the Moodle navigation by doing 1 important thing. Parts of the code were borrowed from the 'Lesson' module, which has a built in 'flow control' feature. This feature links to any other activity upon completion of a lesson in the part where the grades for your attempt are displayed. I hi-jacked this feature and added to it for other modules, such as the Quiz activity (and most others in my moodle). Within the quiz there is a Flow Control setting, which now has the same flow control options as the Lesson module. Editing the quiz now shows a drop down list with activities to link to upon successful completion of a quiz; and a button linking to the next selected activity is displayed to the student on the results page. If a student did not pass this button is not shown - (although I also edited the quiz module code to show a return to 'section / course page' depending on the configuration settings of the entire course - this depends on alls sections are in one page or individually displayed). So, students see something like the attached image at the end of a quiz. This simple change has made my courses much better for course navigation - students can easily navigate from activity to activity or return to sections or the main course page. It's quite intuitive or at least that's what our students tell me. Shame we have to code this in - Why not in Moodle Core? A capability to add H5P's via the text editor would be FANTASTIC! 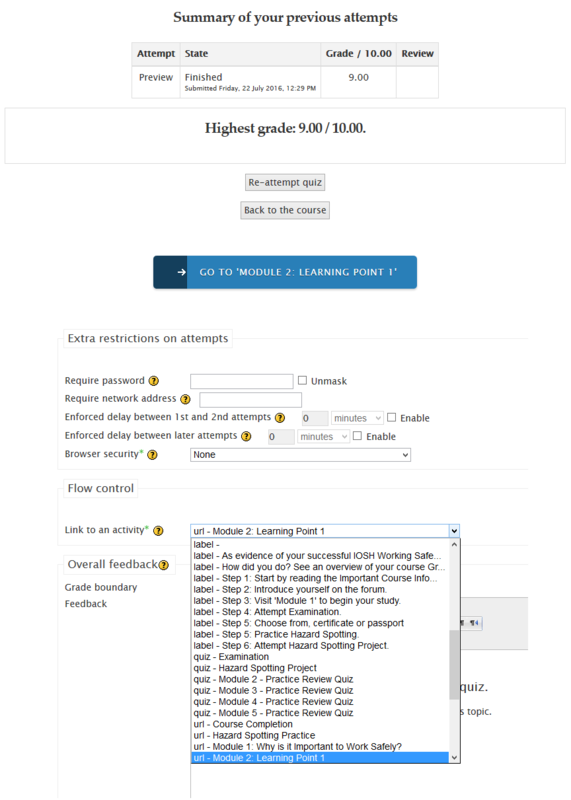 I can then use the lesson, quiz or another module to embed H5P content and at the same time continue to use the navigation method that's in our moodle to control smooth flow of navigation between activities. I hope my ideas are helpful, I can say this navigation control works well in practice. When inserting H5Ps via the text editor would you prefer different grades for each insertion? Glad you appraciate the input. When inserting the H5P's I would agree that it is best to have each seperately graded. If they were inserted into another activity, the grade should probably count towards that activity also. Not sure how you'd practically acheive that, perhaps a sub-grade of an activity that counts towards the total of that activity.....? Either way, each instance should have it's own grade assigned I believe. Hi, i would like to know how h5p calculate grades and if it is possible to configurate the value of the grade to each activity. Each activity has a max score and the grade is the percentage score. It is not possible to configure it yet :/ In what cases would that be useful? In this article there is an example of an interactive video with the embed button underneath. But when using the H5P-Plugin in Moodle this embed option is not available. How come? Is the example not from a Moodle Installation? It is not from a Moodle installation. H5P.org runs on top of Drupal 7. That's good news, I'm really looking forward to see the improvements. I hope that time seeking for more accurate timing is one of the ipmrovements. Our programmer created a pull request to add hundreths of a second timing, rather than limited to 1 second - 1 second really is not precise enough to stop or jump to sections of the videos. I look forward to investigating the new features. It would be a big improvement to have better timings, so I hope you guys have this planned on the development roadmap?